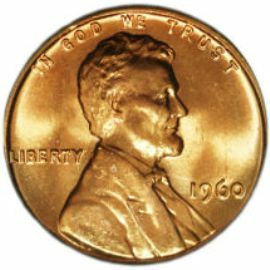 In 1959 the Lincoln Memorial Cent replaced the Wheat Cent as part of the 150th anniversary of Lincoln's birth. The engraving staff at the Mint had been asked to present several designs for consideration. Frank Gasparro, the current assistant engraver at the Philadelphia Mint selected the winning entry. US Mint issue has been in production for 100 years! The Memorial provides the central design of the reverse. 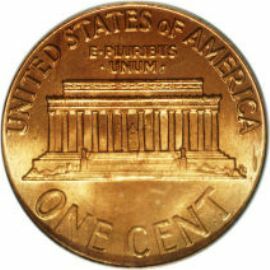 The legends "E PLURIBUS UNUM" and "UNITED STATES OF AMERICA" above the building, and the denomination "ONE CENT" rounding out the motif. Delaware River on the reverse.